Academic Freedom - "Without such freedom there would have been no Shakespeare, no Goethe, no Newton, no Faraday, no Pasteur, and no Lister" - Albert Einstein - Royal Albert Hall 5th October 1933. "The EU Referendum still divides public opinion, with feelings on both sides of the argument still running high. However, the majority of people acknowledge that the public gave their opinion in a free and fair referendum and that the outcome should be upheld. Theresa May has been clear that “Brexit means Brexit”, and there is no doubt that we are going to make a success of it. There must be no attempts to remain inside the EU, no attempts to re-join it through the back door and no second referendum. Given both the high turnout of the referendum and our 2015 election manifesto to “respect the outcome” of it, in my mind the Government has a crystal clear mandate to implement the result of the referendum and reflect the will of the British people." 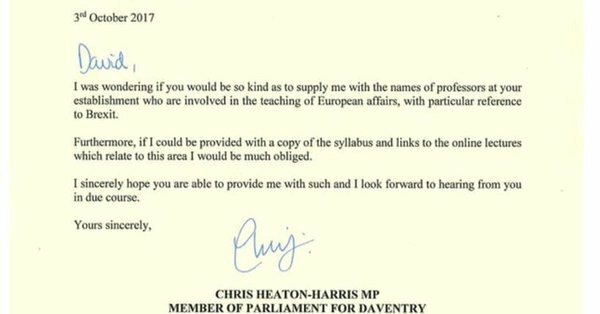 The letter, sent using Parliamentary paper, requested the names of professors involved in the teaching of European affairs, "with particular reference to Brexit." He also requested a copy of the syllabus and links to online lectures relating to this area. 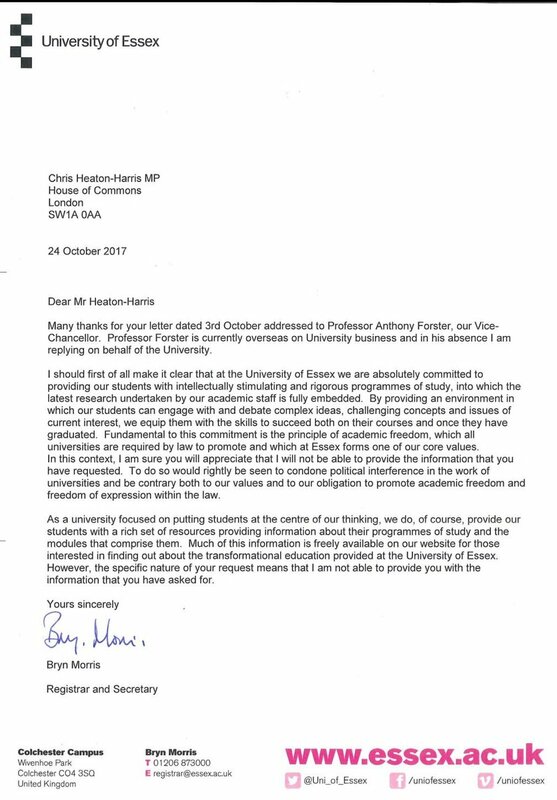 The letter gave no reason for the request but it was later stated by Mr Jo Johnson MP (Universities Minister) that Mr Heaton-Harris wanted the information because he wished to write a book - The Independent 25th October. 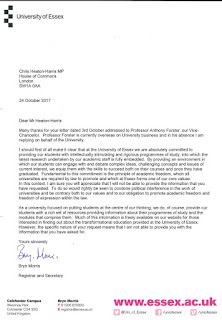 The reply refers to academic freedom and asserts that to provide the information requested would be seen to condone political interference in the work of universities. What is meant by academic freedom? A study by Terence Karran and Lucy Mallinson analyses the freedom into two substantive and two supportive elements. The substantive elements are firstly, freedom to teach. This freedom will normally include some (may be all) of the following: freedom to determine what shall be taught (course content); freedom to determine how it shall be taught (pedagogy); freedom to determine who shall teach (via transparent selection procedures); freedom to determine whom shall be taught (the right to determine and enforce entry standards); freedom to determine how students’ progress shall be evaluated (assessment methods); freedom to determine whether students shall progress (via marking criteria and grade determination). Secondly there is freedom to research. The two supportive elements are : self-governance and tenure. Self-governance consists of the rights: to voice an opinion on the running of the university; to participate in decision-making within the university; to be able to appoint people to, and dismiss them from, positions of managerial authority within the university. Tenure comprises the right to some form of job security within the university, via an agreed procedure involving a peer-reviewed assessment of academic accomplishments, following the successful completion of a probationary period of employment. It also includes the ability to remove tenure from staff who fail to meet minimum levels of competence or to uphold professional standards of conduct. With respect to the granting of tenure, it is incumbent on the probationer to demonstrate competence, while for the removal of tenure the university needs to show due cause. An interesting question is the extent to which academic freedom is supported by the law. Universities usually have a Charter issued by the Privy Council - e.g. City, University of London. That Charter states - "Academic Freedom - Academic staff shall have freedom within the law to question and test received wisdom, and to put forward new ideas and controversial or unpopular opinions, without placing themselves in jeopardy of losing their jobs or privileges." The Education Reform Act 1988 sections 202-208 also address academic freedom. Section 202 created a body of Commissioners known as the University Commissioners who are given functions with respect to qualifying institutions. In exercising their functions, the Commissioners shall have regard to the need - (a) to ensure that academic staff have freedom within the law to question and test received wisdom, and to put forward new ideas and controversial or unpopular opinions, without placing themselves in jeopardy of losing their jobs or privileges they may have at their institutions; (b) to enable qualifying institutions to provide education, promote learning and engage in research efficiently and economically; and (c) to apply the principles of justice and fairness. Although there are such references to academic freedom, the study by Karran and Mallinson concludes that the levels of both the de jure and de facto protection for academic freedom are lower in the UK than in the other EU nations.and although the UK is a signatory to the UNESCO 1997 Recommendation (and other international covenants) successive governments have repeatedly ignored the salient elements regarding academic freedom. They also noted the stronger protection in Scotland under the Higher Education (Governance) act 2016 section 23. The latest legislation is the Higher Education and Research Act 2017. This Act creates a new non-departmental public body, the Office for Students (OfS), as the main regulatory body, operating at arm’s length from Government, and with statutory powers to regulate providers of higher education in England. In performing its functions, the OfS must have regard to the need to protect the institutional autonomy of English higher education providers. It must also consider quality, greater choice and opportunities for students, competition, value for money in the provision of higher education and the need to promote equality of opportunity in access to and participation in higher education. These duties will ensure the OfS will focus on fostering a more competitive system with the aim of driving up quality and outcomes for students and taxpayers, while maintaining protections for academic freedom and institutional autonomy. Section 36 imposes on the OfS a duty to protect academic freedom when exercising its access and participation function. The government has announced the appointment of Nicola Dandrdige as the Chief Executive of the OfS. Once fully operational in April 2018, the OfS will replace the Higher Education Funding Council for England (HEFCE) and the Office for Fair Access (OFFA). As crucial as academic freedom is, Universities need to recognise that, on controversial issues such as Brexit, students will not always arrive at the same conclusions as those who teach. Care will be needed to ensure that such students are not unfairly penalised for holding their views. The Telegraph 29th October reports that some University students have claimed they feel pressured into writing essays which pander to the “anti-Brexit bias” of lecturers amid fears they will otherwise be marked down. Students from across the country have alleged that free debate on Brexit is being “shut down” by pro-Remain lecturers at some of Britain’s top universities. They include undergraduates studying law, politics and PPE degrees, who claim their faculties have created a “hostile” environment which is deterring some with dissenting views from speaking out. The disclosures have prompted concern among MPs and university leaders, who are concerned that pervasive anti-Brexit views may be limiting freedom of speech and academic freedom. 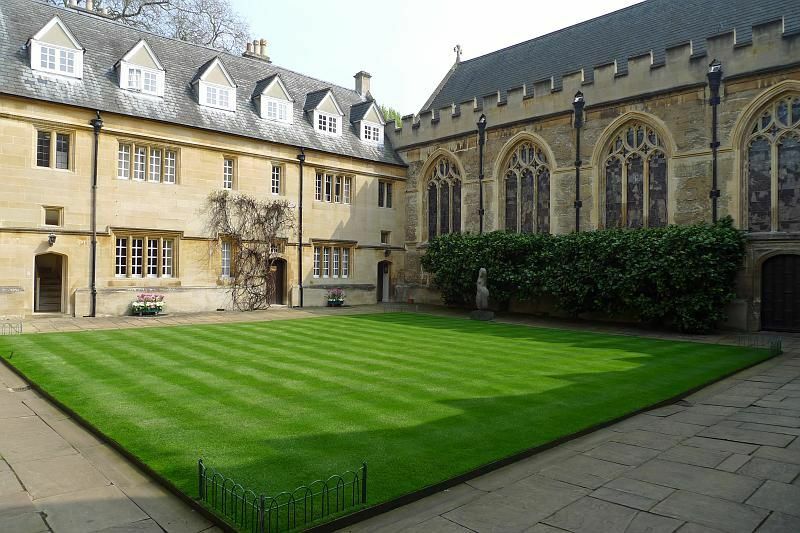 Clashes between Universities and those in power are not entirely a new thing - see the clash between James II and Magdalen College, Oxford. During the English Civil War of the 1640s, Magdalen was solidly Royalist, and had to endure a purge of our President and many of our Fellows after the victory of the Parliamentarians. The most dramatic period in the College history came during the reign of James II. In 1687, the President died, and James tried twice to force the Fellows to accept a President of his choosing. The Fellows refused, and James, losing patience, demanded that all the Fellows who opposed him be expelled. This act caused national outrage: the courage of the Fellows was praised, and the King was much criticised. Late in 1688, James reinstated the expelled Fellows, but it was too late to save him: he was deposed a few weeks later.